Small and petite girls often have a hard time when it comes to shopping for clothes because they want to look great but don’t want to be swamped nor do they want to shop in the kids section! 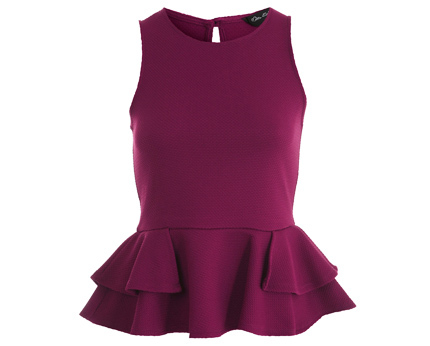 Nowadays many stores offer a range of petite clothes to cater for smaller frames and this peplum fishtail top from Miss Selfridge is no exception, it’s cute, fitted, stylish and incredibly gorgeous on tiny figures. 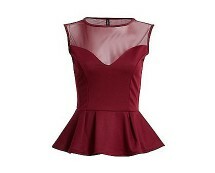 A top like this will help to achieve an enviable womanly figure – just think Kylie Minogue. Super cute and super stylish! The fishtail is the stand out feature to this stunning top; it adds a difference from many other peplum designs and is perfectly flattering for girls who like to wear tops like this over leggings. Try wet look leggings for an ultra stylish look. Don’t forget those big heels of wedges girls, to elongate your lovely legs! For a more sophisticated approach opt for a cute fitted mini or just above the knee skirt in black to wear with this top.